Winter – This is the latest edition of Pilot International’s quarterly publication. This edition highlights the 2019 Annual Convention. This edition can be downloaded using the “download” link below or viewed directly on this page by clicking the Pilot Log cover image. Fall – This is the latest edition of Pilot International’s quarterly publication. This edition highlights Pilot International’s Safe Harbor Fund as well as the most recent Pilot Club News. This edition can be downloaded using the “download” link below or viewed directly on this page by clicking the Pilot Log cover image. Summer – This is the latest edition of Pilot International’s quarterly publication. 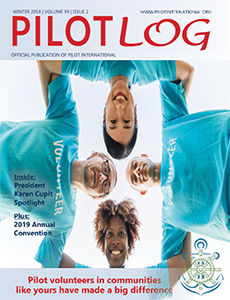 This edition highlights the 2018 Pilot International Convention as well as the most recent Pilot Club News. This edition can be downloaded using the “download” link below or viewed directly on this page by clicking the Pilot Log cover image. Spring – This is the 2018 Spring edition of Pilot International’s quarterly publication. This edition highlights the BrainMinders Program as well as Pilot Club News from early 2018. This edition can be downloaded using the “download” link below or viewed directly on this page by clicking the Pilot Log cover image.